The Russian missile cruiser Moskva sails near the Syrian coast in this photo made from video posted to the Russian Defense Ministry official web site on Friday, Nov. 27. NATO says it is bolstering Turkey's air defenses in the wake of last month’s shootdown of a Russian plane by Turkish jets. The announcement was made as Russia and Turkey increased their military buildup on the Turkish-Syrian border, fueling fears of a new confrontation. 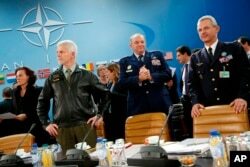 NATO's decision likely will be viewed as a diplomatic victory for Ankara. Ever since Turkish jets downed the Russian bomber that allegedly violated its airspace on the Syrian-Turkish border, Ankara has looked to its NATO partners for support. The decision coincides with Moscow boosting its military presence in Syria, which political scientist Cengiz Aktar of Istanbul’s Suleyman Sah University says now poses a serious threat to Turkish forces. "They are sending the ship Moscova [Moskva] with S400 anti-aircraft missiles and they may retaliate. Turkey has no military means and power to counter Russia’s actions in the region without the help of the Americans and others," said Aktar. Along with the Moskva, Russia has deployed to Syria S400 missiles, whose range extends well into Turkish airspace. Analysts say NATO is expected to send ships to the eastern Mediterranean, along with more warplanes to Turkey's Incirlik Air Base, close to the Syrian border. Ankara is increasing its deployment of fighter jets patrolling the Syrian border. Sinan Ulgen, of the Carnegie Institute in Brussels, says NATO support will likely strengthen Ankara’s stance against Moscow. "The feeling in Ankara is that Turkey has every right to do what it did. There will not be an apology and Ankara expects its partners in the West to support this position. If there is another violation we can unfortunately expect repeat of what's happened," said Ulgen. Despite NATO’s claim its planned Turkish deployment is not against Russian forces, observers warn it will likely further hamper efforts to persuade Moscow to coordinate in the fight against Islamic State. Even with the latest developments, observers say the first sign of a possible easing of tensions could be the announcement that Russian Foreign Minister Sergei Lavrov will meet this week with his Turkish counterpart, Mevlut Cavusoglu, on the sidelines of an OSCE conference in Belgrade.